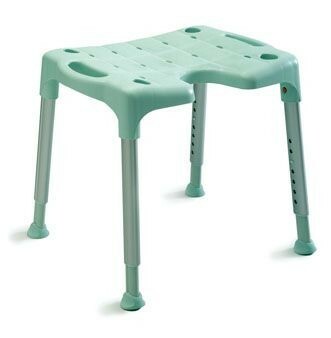 Available as a simple stool or a complete shower chair, the stool can be quickly and easily converted to meet the users changing needs by adding armrests or a backrest as required. The seat has a cut out on one side and is solid on the other and may be assembled in either direction to suit the user. The soft ferrules ensure a good grip on all surfaces and the anti-slip pattern on the seat provides safety and stability. The oval telescoping legs are simple to adjust by hand. A handle in the rear of the backrest makes the lightweight Swift easy to carry and move.Supplied flat-packed they are easy to assemble without tools and can be dismantled for cleaning, transport or storage.Manufactured from a combination of plastic and aluminium that is sturdy yet flexible enough to adapt to uneven floors. Optional extras include a soap and shampoo dish which is clipped to the side of the seat and provides a convenient home for the shower head. The soft seat and backrest pads are heat reflecting and provide additional comfort. Swift is easy to clean in temperatures up to 85°C and may even be cleaned in a dishwasher.Maximum User Weight: 20 Stone (130kg). Seat height adjustable from 420 to 570mm (161/2 to 221/2"). Backrest height 800 to 950mm (311/2 to 371/2"). Seat size 540 x 410mm (211/4 x 161/4"). Footprint at highest adjustment 540mm (211/4") wide, 500mm (191/2") deep. External width with armrests 560mm (22").